Well, that's different. The next major iteration of Android will be called Kit Kat, it seems. 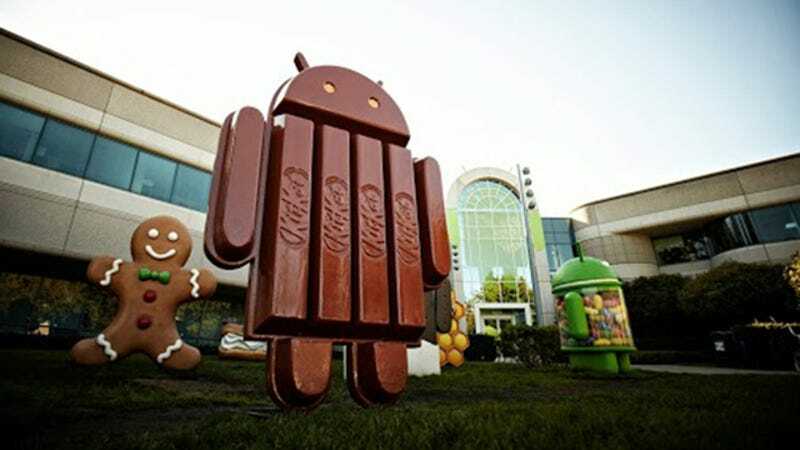 We know this because Android boss Sundar Pichai just tweeted a photo of a gigantic Android robot made of Kit Kats. Apparently that's going to come along with a promo campaign in Kit Kats to win a free Nexus 7 or Google Play credit, which is a strange and probably unnecessary bit of advertising, but fine. Your operating system is a supermarket aisle ad now is all. For the uninitiated, major releases of Android get dessert names, and they've been progressing in alphabetical order. So Ice Cream Sandwich was succeeded by Jelly Bean, and now Kit Kat. Our dumb but prescient guess in 2010 was Krispy Kreme. Beyond the goofy name, this does have actual bearing on Android. The new name implies a major refresh to the operating system. Ice Cream Sandwich (4.0) was released back in 2011 with a major redesign, and since then we've had three versions of Jelly Bean (now on 4.3). Kit Kat will be version 4.4, so we probably won't need to wait too long for it, but the advancement to a new name should mean we get some substantial updates. Or it could be the groundskeeper at Google got bored. Anyone's guess, really. We'll update you with further news once we have something beyond a giant candy bar outside of Google.